If you’ve ever phoned Pro Mobile, Rachel Gray is likely to have been the friendly person you will have spoken to. If she seemed a little stressed or tired over the last eight months, it’s because since September 2013 she has been living a double life; spending her days working in the Pro Mobile office and her evenings and weekends hitting the road to train for the London Marathon! 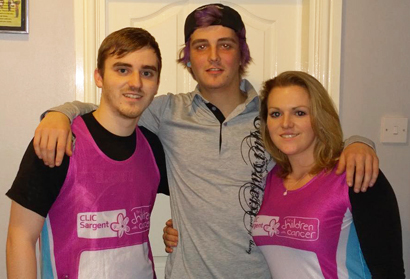 After their younger brother, Callum (17), was diagnosed with leukaemia in January 2013, Rachel (23) and her brother Alex (19) (pictured here with Callum and wearing their marathon vests) decided to complete the race to raise money for the CLIC Sargent charity, which has given their family both financial and emotional support. CLIC Sargent is a leading cancer charity in the UK which helps children and young people, as well as their families, by providing clinical, practical and emotional support. Their ‘Home from Home’ accommodation, located close to treatment centres, enables families to stay nearby whilst the charity also offers free holiday breaks at the Malcolm Sargent House (in Ayrshire) where young people and their families can take a much needed break. Callum was treated at The Christie NHS Foundation Trust, based in Manchester, where CLIC Sargent provides the young people with a number of activities to keep them busy. The hospital features a games room with pool tables, an Xbox and DVD player, as well as a dedicated music room – the latter of which Callum, a keen drummer, found particular comfort in during his time there. Funds from the charity also ensure that all patients in isolation have Sky TV and an iPad, to help pass time alone. Following an incredibly spirited struggle against the disease – and thanks to help from the CLIC Sargent charity – Callum is closer each day to making a full recovery. In light of all that the charity has done for Callum and the family, and as a way of echoing his bravery, Rachel and Alex decided to give themselves a test by running the Virgin London Marathon. The UK’s biggest marathon – which saw 34,631 people run in 2013 – takes place this Sunday (the 13th of April), with the finishing posts positioned on the flag-adorned promenade of The Mall. The two siblings will run at 10.00am and, despite the starts being staggered, will undertake the same gruelling 26-mile course as Olympic legend Mo Farah. A number of sporting and celebrity figures will also take part, including Michael Owen, Lewis Moody, Miquita Oliver and Gilles Peterson. Rachel has been training since September, with a schedule comprising two short runs (one on the road, one in the gym), one medium run, and one long weekend run per week. On the days she isn’t running, she rounds out her training regime with more general cardio workouts at the gym; including spinning, treadmill work and sessions on the exercise bikes. Make sure you do, Rachel – it will be truly well-deserved!